Be patient as the picture loads. 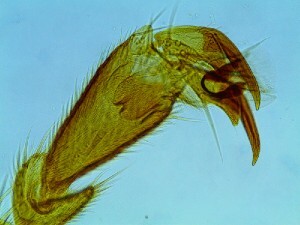 It is an animated GIF showing the claws of the leg of a honey bee (the tarsus). Take a series of pictures of different focus. Make sure that they are numbered consecutively. In GIMP, click File – Open as Layers. Resize the image, otherwise the file will be too big. Click Image – Scale Image to do this. Click Image – Mode – Indexed and change the picture to indexed, and select dithering from the dropdown list. Click File – Export and export the image as a GIF. A dialog will appear where you can set parameters for the animation. Do not forget to give the file the file extension .gif. To view the file, you have to open it in a web browser. Try simply clicking on the file, often a browser window will open this way. How do you make a permanent slide? I like this post how the hidden things when comes looks so good. It really looks good. What’s the benefit of making a gif like this compared to using focus stacking with the samematerial to create one image with an extended depth of field? I can only thing of one: this is a more “accurate” or “true” representation of the source material, a focus stacked image is perhaps more prone to inaccuracies such as artifacts from the stacking etc. But the gif image format is limited to 256 colors and as such a lot of the information in the image are lost when doing this as well. Anyway, I think this is really cool, and I’d love to see more gifs in the future.